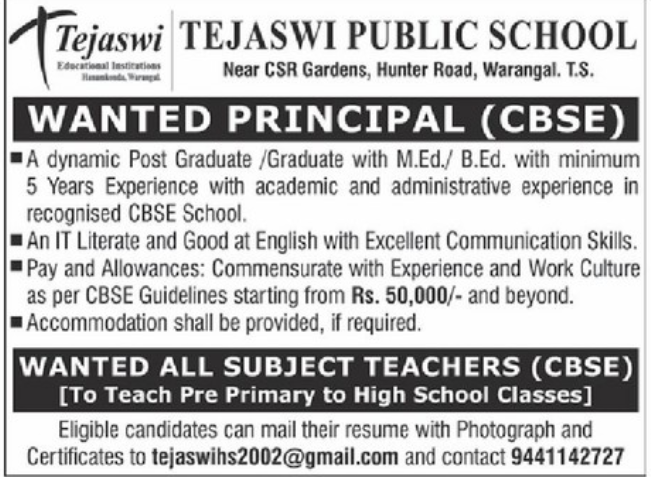 Tejaswi Public School, Warangal has advertised in Eenadu newspaper for recruitment of Principal, Teachers job vacancies. Interested and eligible job aspirants are requested to apply immediately. Check out further more details below. 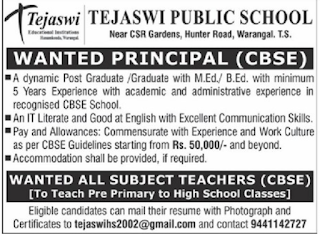 Name of the School: Tejaswi Public School, Warangal, Telangana State. About School: Tejaswi Public school is one of the famous school in Warangal. (a) Principal: A dynamic Post Graduate/ Graduate with M.Ed/B.Ed minimum 5 years experience with academic and administrative experience in recognized CBSE School. (b) An IT literate and good in English with Excellent communication skills. (i) Teacher: To teach pre primary to high school classes. Job Location: Warangal, Telangana State. Principal: Commensurate with experience and work culture as per CBSE guidelines starting from 50,000/- and beyond. Accomodation shall be provided, if required. How to Apply: Interested and eligible candidates can mail their resume with photograph and certificates to mail id.